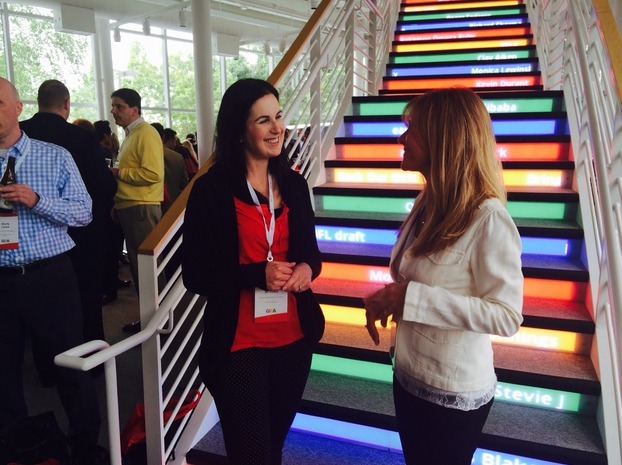 DreamMaker marketing chief Jamie Brooks attends a summit at Google HQ in Mountain View, California. Each step in the staircase features a topic trending in Google searches. Effective online marketing is essential for winning customers and growing a business, which is why the DreamMaker remodeling franchise was excited to spend a few days recently with Google at their headquarters in Mountain View, California. DreamMaker Bath & Kitchen joined several other members of the International Franchise Association for a May conference focused on internet marketing, current best practices and things to watch for the future. It was the type of opportunity that’s simply not available to most remodelers, and it’s an example of the power that comes from being part of an award-winning franchise. The lessons we learned are being shared with our franchisees and implemented on our websites in order to drive greater results for all DreamMaker owners. Google is eager to make the web a less complicated place by making it easier for businesses to update their information. For instance, rather than being forced to update your information in multiple Google accounts, such as Google Places for Business listing, and on Google+, you will be able to update all of your information directly from your Google+ listing. The upshot? This change is going to make your Google+ listing much more important. If you aren’t currently making much use of Google+, you should start now. 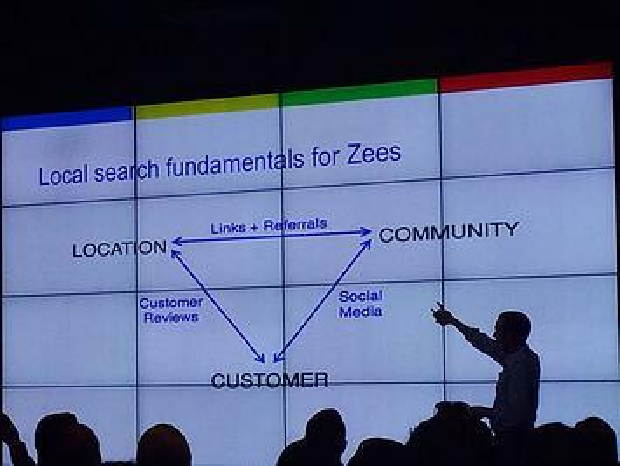 Search engine visibility is key to winning new customers, and the gathering provided the latest insights. Google dominates internet search. “Googling” has become synonymous with searching the web. Google has become dominant thanks to its devotion to serving up search results that it believes will be most useful to readers. To accomplish that feat, Google uses complicated algorithms to judge the quality and relevance of websites and web pages. Google, as well as online marketing experts at the conference, discussed ways to improve search engine results, as well as the most effective ways to take advantage of local advertising, such as by creating PPC campaigns that are tied to specific pieces of content. Marketing is ever-changing, with businesses working to get the attention of customers amid constant new media and technologies. Without professional marketing support, it is very difficult to keep your efforts current and effective. That’s especially true of digital marketing. Placing a TV or radio ad hasn’t changed much over the past few decades, but digital marketing has been a constant whirlwind. Ten years ago, Facebook didn’t exist. Five years ago, mobile websites were a novelty that didn’t have much impact on a business, and the first mobile apps were in their infancy. Three years ago, Google+ didn’t exist. Today, every single one is a powerful tool that a small business can use to reach customers and grow. Those who leverage these tools best have a huge advantage, especially in local markets. DreamMaker Bath & Kitchen’s marketing chief, Jamie Brooks, attended the Google summit, and she serves as a resource for our franchisees nationwide. It’s extremely hard to stay up-to-date on online marketing while also managing a remodeling business day-to-day, but DreamMaker’s headquarters staff is able to devote attention to the changing marketing landscape, then devise tools and marketing plans to help our franchisees outperform their competition. We have partnered with great business owners and remodelers who have won numerous awards for their outstanding designs, and they deserve to be discovered. By staying abreast of local search marketing techniques, we help increase the visibility of DreamMaker remodeling franchises nationwide. Of course, our ability to devote a great deal of attention to marketing is just one advantage that we are able to pass along to our franchisees. Another is this: We are a nationwide network that is able to build relationships with important vendors — even giant corporations like Google. Not many remodelers are going to be invited to Google HQ to learn about online marketing, but thanks to our size and our affiliation with the International Franchise Association, we were able to obtain that access. The relationships that Jamie built while meeting with Googlers (what Google employees call themselves) will be invaluable as we work with franchisees to improve search engine performance. When there are questions, if we don’t already have the answer, we’ll have a direct line to people who can help. To learn more about how DreamMaker Bath & Kitchen works to help franchisees start and grow remodeling businesses, visit our research pages. To start a conversation and learn more about DreamMaker, fill out a form to download our free franchise report. We look forward to talking with you!